Tempered hiring in August plus a decline in the unemployment rate to a seven-year low complicate the Federal Reserve’s September decision on whether it should raise its short-term lending rate. The central bank will have to decide whether the labor market and the broader economy are sufficiently strong to justify a hike, while also balancing risks related to equity market volatility, tepid inflation and wage growth, the strength of the dollar, and wobbly foreign economies. At present, it remains a toss-up on whether the Fed will move forward in September or delay raising the Fed Funds rate until later this year or even 2016. Employers added 173,000 positions in August to push the year-to-date total to 1.7 million jobs, primarily in private-service sector industries. Weaker economies overseas and the strong dollar have limited foreign sales for U.S. companies, a trend underscored in sector-level hiring results last month. More than half of the jobs added in August, or 95,000, were in government, and education and health services, employment sectors that are largely insulated from overseas influences. The strong U.S. dollar also continues to weigh on companies that manufacture to export. A softening of a key manufacturing index last month coincided with a loss of 17,000 positions at plants and factories. One bright spot was an increase in transportation equipment manufacturing payrolls of 5,100 jobs last month as U.S. consumer demand for automobiles and light trucks remained elevated. Last month’s fall in the unemployment rate to 5.1 percent marked the lowest level recorded since April 2008, and conditions tightened or remained tight in specific demographic groups. 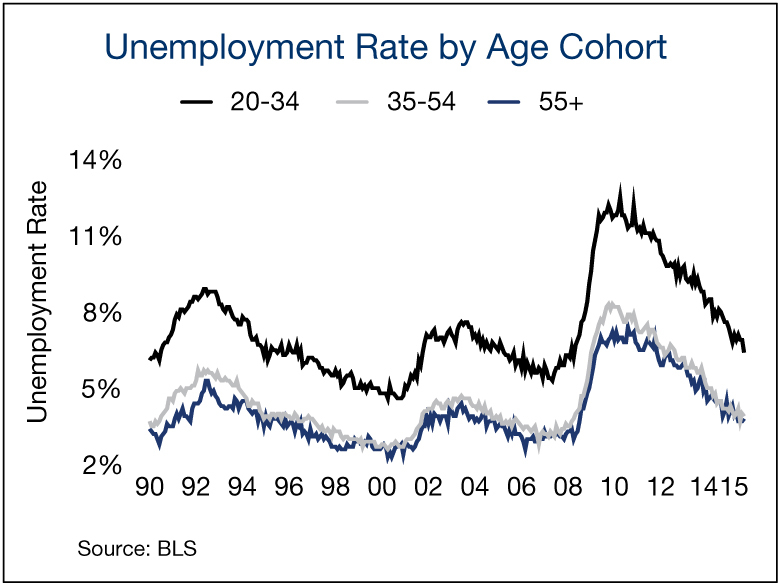 The unemployment rate among those ages 35 to 54 held at less than 4 percent to mirror pre-recession levels. The tighter market for the economy’s most seasoned workers, however, is not translating to significant gains in wages. For all workers, the average hourly rate outpaced inflation, rising by a modest 2.2 percent year over year. Within the education and health services sector, more than 21,000 jobs were created in ambulatory health care, a key driver of demand for medical office space. Professional and business services, and financial services also chipped in a combined 52,000 jobs in August to provide additional momentum in the office sector. The national vacancy rate was 15.3 percent at midyear, but growing demand and a thin construction pipeline will support a 40-basis-point drop in vacancy to 14.9 percent by year end. Retailers hired more than 11,000 workers in August as new stores opened and existing outlets replaced younger employees heading back to school. The U.S. retail sector remains robust but stymied by a lack of multi-tenant construction that is suppressing additional new store openings. National vacancy stood at 6.4 percent at midyear and is forecast to fall to 6.1 percent in 2015, accompanied by a respectable 2.3 percent rise in the average rent. The Research Brief blog from Marcus & Millichap offers timely insight and expertise into the rapidly changing investment real estate industry. The Research Brief is published by top industry professionals, showcasing time-sensitive information and valuable analysis. Add the Research Brief blog to your reading list today. This entry was written by marcusmillichap, posted on September 8, 2015 at 6:11 pm, filed under Uncategorized. Bookmark the permalink. Follow any comments here with the RSS feed for this post. Post a comment or leave a trackback: Trackback URL.